In cold, wintery cities like Buffalo, NY and nearly everywhere I've ever lived, holiday decorations are a necessity. They help keep people from succombing to those winter blues. The weather is just so miserable this time of year that it's so difficult to find much to be happy about. The days are short, and the roads are so snowy or slick that you're afraid to pull your car out of the driveway. This past weekend, I locked myself in. I didn't want anything to do with the outside world, and all of that snow! I did a full, deep cleaning of my apartment and at one point Best Coast's "The Only Place" came on my Spotify singing, "We wake up with the sun in our eyes/It's no surprise that we get so much done/But we always, yes we always have fun...Why would you live anywhere else?" It made me miss California, Florida beaches, and those two days of the year in Buffalo when people complain about it being "too hot." Alas, it's winter. And it's Buffalo. And I can't change that. So let's make the most of it and enjoy the season. Sundays tend to be major crafting and nesting days for me. 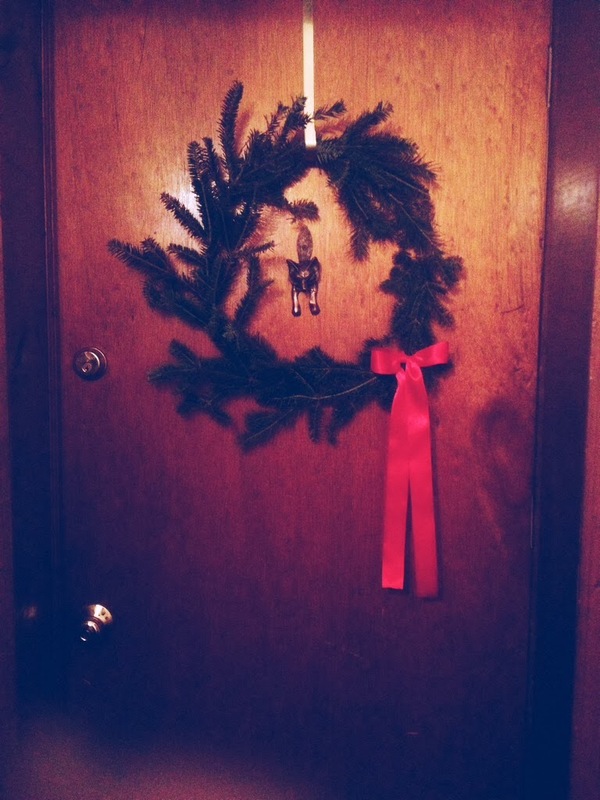 After Thanksgiving, I created three small wreaths and one medium wreath to put on my door and in my front windows. Since this year is very budget conscious, I decided not to splurge on a tree. Instead, I went to Lowe's and raided their tree trimming box. They give away the trimmings from the trees that they sell, for free! First, I took some green crafting wire, usually used for floral arrangements and wrapped it in a circle. I wanted the window wreaths to be small. I wrapped until I got a nice, stable base. Then, I clipped the branches and used hot glue to attach them to the wire base. I overlapped in spaces, and just went along in a circle until it looked good. For the large wreath, I did the same process, except I made the base bigger, and glued more trimmings. I finished it off with a big red bow. I toyed with the idea of adding some pinecones, but I really liked the simplicity of the wreath, and I liked the way it framed my fox door knocker. I don't like gawdy decorations. I like a certain color scheme for the holidays: rich red, shimmering gold, wilderness green, and snowfake white. I also like a natural element to decor. No giant blow up snowmen or snow globes for me! I bought a single string of lights with white roping and draped that around the window. On my door, I hung the large wreath on a golden hook. The other three small wreaths hung from translucent wire in the front. I gathered up two large brushes of trimmings and tied them together, then hung them from either side of the front windows, on the inside. I made crepe paper bows and draped a few layers of crepe ribbons along with the lights. While I was at my dad's farm, my sister and I gathered some beautiful apple tree branches. They have these great knobs, and shapes to them. I stopped in to a thrift store and picked up two tall, sturdy, clear vases to acompany the medium sized vase I had at home. Next, I trimmed the branches and arranged them to fit in the vase. I decided to finish them three ways. For the tall branches in the tall vase going by the fireplace, I spray painted those white. I wanted the shorter branches that went in the medium vase on the table to be painted gold. And, I decided that the final branch bouquet would be gold glitter! They turned out pretty good, I think. It was a quick project and super cheap! I arranged some scented pinecones from the craft store by the branches, or in a clear bowl with a ribbon. I spray painted a few white for fun. I also bought some white candles that I painted gold and dipped in glitter. I love candles and I normally have a few burning at night. I drew a flurry of snowflakes on my office chalkboard wall that look pretty cute. I think it all looks festive. It definitely keeps those winter blues from taking over.